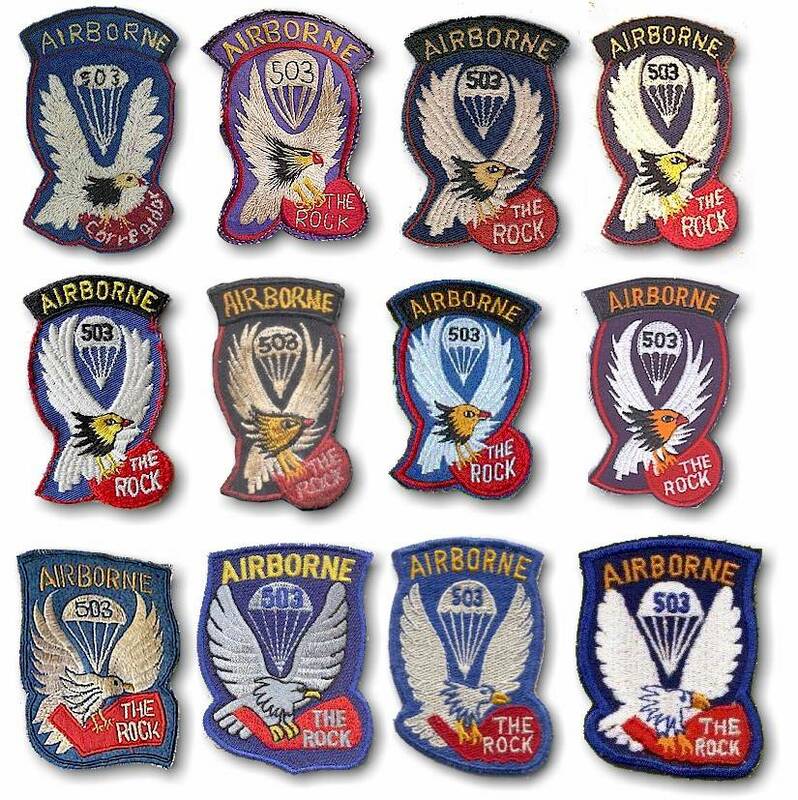 "OF CHICKENS, SPARROWS AND EAGLES"
The Rock Patch is the insignia of the 503d Parachute Regimental Combat Team which served in the Pacific Theater of operations during World War II. The Combat Team was formed from the 503d Parachute Infantry Regiment, to which was added an the 462d Parachute Field Artillery Battalion, and the 161st Parachute Engineer Company. Over the years since the war, a significant amount of time has been spent by many of us, including John A. Reynolds via his column the THREE WINDS OF DEATH, tracking down the source of various documents and insignia which have a bearing on the history of the 503d. None of these pursuits have been as elusive as the origin of the true design of the Rock Patch. For more than a decade I had been given all kinds of scenarios as to where the shoulder patch was designed, whose idea it was, who made the first drawing and on, and on ad infinitum. Well, more by good fortune than by dogged research, I nailed it down whilst attending our 1996 Reunion in Orlando. The person who designed the patch is Thomas M. McNeil, a former Pfc in Company "G" and a retired thoracic surgeon of Orlando, Florida. Tom had been recuperating from malaria while on Mindoro Island following Corregidor, and requested brushes and paint from an attendant nurse and put his design to paper - well, actually to his barracks bag. The design caught everyone's interest almost immediately and soon appeared outside "G" Company HQ. 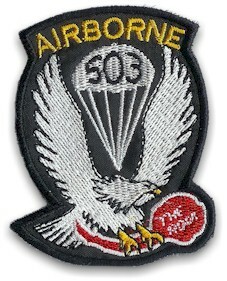 "In as much as the Corregidor operation is considered the outstanding contribution of the 503d to the conduct of the War, it is requested that your proposed insignia include reference to that operation in some manner; possibly by the addition of a map within the canopy or clutched in the talons of the eagle." Copies of the designs were first made by Filipino seamstresses and though they were creditable examples of fine embroidery, they were interpretations and imitations and none ever accurately portrayed the original design. When the Team was transferred to the Army of Occupation in Japan, copies of these copies were again produced, this time by Japanese seamstresses. Later copies of the copies of the copies be produced by Korean, Vietnamese U.S. , Indian and even Chinese sources. The fact that some of these reproductions of the "Rock Patch" were made by Filipino, Japanese and American seamstresses is a mute point. The facts are that Tom McNeill created the design of the patch after we returned to Mindoro from Corregidor and Lt. Colonel Joe Lawrie approved it. As an approval of a design or patch by a local commander for use in a combat theater is not an official US Army approval, the US Army has never officially approved either the design, or the patch. Thus, its design has never been standardized. One must be careful of believing anything one reads on that giant marketing machine, eBay, particularly in respect of 'WWII original Rock Patches.' The reality is that there are no official Rock Patches, and many described as being of WWII manufacture simply are not. The patches depicted below are, to my mind, "close, but no cigar." They may have their own individual histories but they do not represent McNeill's approved original art work. They are examples of cloth patches reflective only of the times, technologies and places of their individual manufacture. The bird depicted in most of them is, to the minds of many of our brother troopers, 'a chicken', perhaps 'a sparrow', but not an eagle. 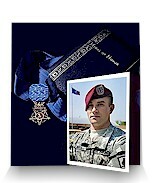 The Author, Bob Flynn, is the 503d PRCT's Official Historian. 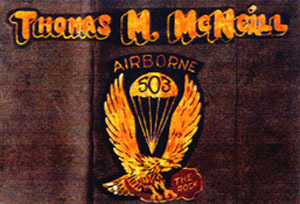 The patches depicted above do not represent the approved original art work of Thomas McNeill of "G" Company. The patch below is the ONLY one based on the McNeill design, but is not recognized officially by the 503d PRCT Association of WWII Inc. It was produced for the US Embassy's special guests attending the 60th Anniversary of the Raising of the US Flag on Corregidor, 2 March 2005. Bob, you are correct in your remarks about the Rock Patch. Before the Association meeting you spoke of, I did considerable research and have a large file today. Many inaccuracies have been given about the patch including what has been designated the "Chicken Patch." Long before the Association adopted your recommendation that Thomas O'Neill be acknowledged as the author of the patch, I recall the first time I saw the patch was on a drawing at regimental headquarters in Bacolod in early July, 1945. I copied it on a piece of brown wrapping paper, or sack, and still have that copy today. On Oct. 1, 1996 Bill Bossier wrote of his recollection that Gen. Jones had asked him to design a patch while they were attending the Boston (the first) reunion. Bill confessed that he took no action, saying that he "treated the whole project much too casually." He didn't know what happened after that. I have seen a picture of a painting in front of the orderly tent at Bacolod displaying O'Neill's patch along with several other line pictures. Henry Capiz has done a great amount of work on the patch, and can tell much about its appearance in Japan and early patches.